Aficionados of El Greco - such as Bill Clinton(!) - will hopefully enjoy this Biography of El Greco. El Greco is Castilian for "The Greek" for - although he spent most of his life in the Toledo area of Spain - he was Greek by birth, always signing his paitings in the Greek Byzantine way. An extremely pious, cultured man, his very intense, spiritual works are famed for their tortuously elongated figures. Our recent excellent guide in Toledo - who explained many of his works to us in detail - left our group extremely inspired by this artist's paintings and their significance. Apparently, El Greco sometimes used interns of hospitals/mental institutions as examples to help create the characters of his works, believing them to be closer to God. View from the outskirts over the charming, historic city of Toledo. Born 1541 in Candia, Crete and named Dominikos Theotok pulos. First trained as an icon painter. About 1566-1570 went to Venice, Italy, where he studied art under, and was influenced by, Titian and Tintoretto. Around 1570-1576 he was in Rome - where he first became influenced by Mannerism. Round about 1577, El Greco emigrated to Spain - briefly to Madrid, then onto Toledo, where he remained until his death. 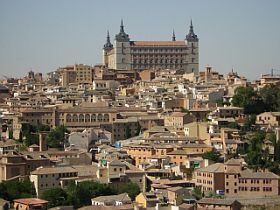 Toledo was then the religious capital of Spain and, here, he produced more mature works. Busily engaged from the word go with commissions for churches/monasteries/convents of the area. Socialised with humansits, scholars and churchmen. 1603-1607 - Luis Trist n was a pupil of El Greco. 1614 - died in Toledo, outlived by his son and his son's mother. After his death, the painter's work fell into obscurity until the late 19th century, when there was renewed interest and his liberation of form, light and colour inspired such artists as Pablo Picasso. Christian doctrines had a tremendous influece on both El Greco's life and artwork. Because he was guided by his religious principles to such an extent, El Greco referred to himself as an artist-philosopher. His works show Byzantine and Mannerist influences - the images conceived in the mind, the light incandescent, colours pure, and figures elongated. They portray overwhelming devotional intensity, making him the most vital visual representative of Spanish mysticism. He often produced an open pipe between Earth and Heaven (eg the Annunciation), implying he could see the holy path from common human existence towards a very real Heaven. Although he primarily painted religious works, he also did some portraits - of extremely high quality. Was also a sculptor and architect. 1577-1579 - First Spanish commission from Church Santo Domingo del Antiguo, including "Assumption of the Virgin" - which marks a turning point in his art, revealing his full genius - "Trinity", and "Resurrection". 1578-1579 - "Allegory of the Holy League"
1580-1582 - "Martyrdom of St Maurice"
1586-1588 - "Burial of the Count de Orgaz" - regarded as his masterpiece. His Mannerist method of composition is clearly expressed, with all the action taking place in the frontal plane. Portraits include himself and his son. The work can now be seen in Santo Tom Church, Toledo. 1595 - "View of Toledo"
1610-1614 - "View and Map of Toledo"
1612-1614 - "Adoration of the Shepherds"
Return from Biography of El Greco to top tour of spain home page.